Iraq requests that UK documents to be used in Iraq are correctly legalised before they will be accepted. Processing documents with the Iraq embassy can be complicated and time-consuming task if not completed correctly. Trusting a professional embassy legalisation service with your documents will ensure that your important documents are correctly attested. If you need to do business in Iraq then it is likely that you have been asked to attest documents at the embassy. Whether you are opening a bank account, signing agreements, setting up a new branch or selling goods or services, we can help you with your documents. Our inclusive service takes care of solicitor certification, the UK apostille, Chamber stamps and the embassy attestation. 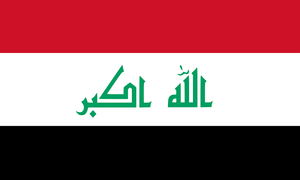 Your documents will be legalised for Iraq in approximately 10-15 working days. How do we attest documents for Iraq? What Does Iraq Attestation Look Like? Commercial documents must first be issued with the apostille. 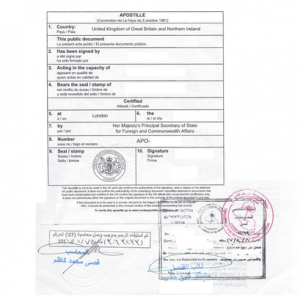 Following this, the document will be stamped by the British and Arab Chambers of Commerce. The document can then be stamped and attested by the embassy.